Happy Friday! I am ready for the weekend after this odd week and have some ambitious plans for it that includes a raw dessert lecture at Whole Foods, dropping off all the unused computer parts in our office to be recycled and a trip to a huge, local pumpkin patch for cheap pumpkins and fresh squash. I’ve been offered Halloween candy twice this week so far which got me thinking about the best way to turn it down without offending or getting cought up in an office diet debate. Before when someone offered me a treat, I used to follow up “No thanks” with an excuse, like “I just brushed my teeth” or “I’m still stuffed from lunch”, but never “I’m careful about what I eat” or “I’m on a special diet” because I don’t want to offend anyone. But, I’ve decided a simple “No thanks” will suffice followed up with nothing, no need to make an excuse, explain myself or offer more info than needed unless someone inquires and maybe not even then. 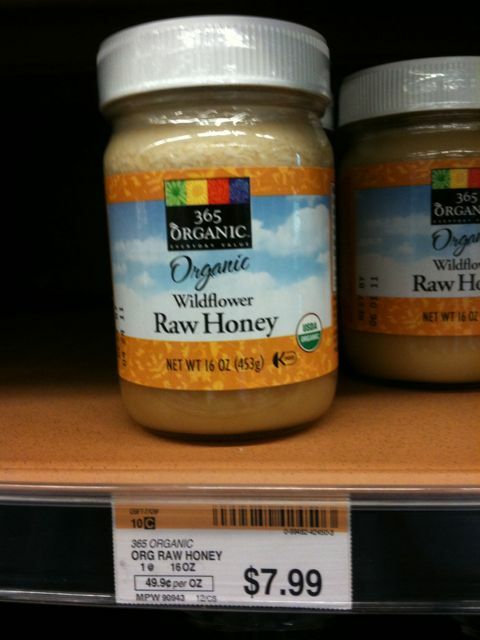 Anyway, another new ingredient I learned about in the first raw food prep course I took is raw honey and it should always be used in place of regular honey and many sweeteners. But, it’s also considerably more expensive than regular honey and looks different with an opague, light color and thicker consistency. Naturally I wanted to look into more before investing into a jar. The basic definition of raw honey is as it exists in the beehive or obtained by extraction, settling or straining without heat. It can contain pollen, wax and enzymes and it has not been pasteurized, or heated to reduce moisture, destroy yeast cells and sterilize it. The theory is that pasteurization removes too much of the stuff that’s good for your body and flavor, like cooking vegetables. Preserving the enzymes are the primary reasons for choosing raw honey over pasteurized, many sites selling raw honey make it seem like a miracle drug. The primary enzymes found in raw honey are invertase, diastase and glucose oxidase which have anti-fungal and antibacterial properties, help digestion and many more positives according to various sources. There seems to be minimal safety benefits from pasteurizing honey and raw honey is the better way to go for flavor and nutrition. But not a good idea to put into hot teas or cook with as it will have the same effect as pasteurizing it.